#610 – 773 Glenmore Road in Kelowna – within ‘The Conservatory’ building on the corner of Glenmore Road & Summit Drive. Visitor parking – stalls #55-58 – Additional parking available along the roadway or at the adjacent newly developed Hillside Plaza. 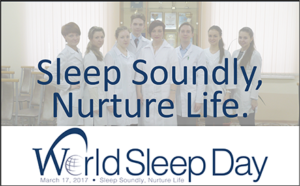 COMMUNITY SLEEP COACH is an official World Sleep Day delegate. We leave you with the official press release provided by the World Sleep Society. Help spread the word!